The portion, Balak, begins with the people of Israel conquering the land of the Amorites. Balak, king of Moab, understands that the children of Israel are nearing him, and prepares to face the nation that came out of Egypt. He sends messengers to Balaam, son of Beor—who was famous for his great wisdom and power of his curses—and asks him to curse the people of Israel. Balaam leaves for the land of Moab having accepted the harsh stipulation to say only what the Creator will permit him to. Along the way his mare stops. Balaam beats her but the mare won’t move. Balaam cannot see the angel stopping the mare. The mare opens her mouth and speaks to him, and instead of cursing Israel he blesses them. Balak is furious with Balaam. As a compensation, Balaam tips him that Israel has a weak spot: the daughters of Moab. Balak sends the daughters of Moab and the people of Israel fornicate with them so much that even Zimri, son of Salu, one of the presidents of the tribe of Shimon, takes a Midianite woman. This situation leaves Pinhas, son of Elazar, with no choice. He takes a spear and stabs them to death, thus stopping the plague that has spread in the nation claiming twenty-four thousand lives. This story does not happen on the corporeal level. It is not about a process unfolding between two nations, but rather an internal correction process that one experiences. The story itself comes to show us how to correct the evil inclination. It is not a tale about children or grownups, nor is it a story about nations, countries, wars, prostitutes, or mares. All it describes is the correction of the evil inclination. It is the only thing that the Torah (Pentateuch) describes from the very beginning, from Adam—who began the correction—to the end. The text speaks of a person who went through this path as Adam HaRishon (Adam), as Abraham, and as Moses, and who went through the whole process in Egypt and in the desert. During the gradual correction of the desire, a person gradually nears the land of Israel until one is faced with the “conquest” of the land. The spies discovered that the land of Israel is a desire that, if aimed entirely at the Creator, yields beautiful fruits [Israel means Yashar El (straight to God)]. A person who approaches that correction initially acquires the land of the Amorites followed by the land of Moab, which is a higher degree. Man’s egoistic desire known as “the king of Moab,” Balak, begins to seemingly rebel against him because it does not want the corrections. All our desires are initially evil inclination, as it is written, “I have created the evil inclination.” This is why the desire called Balak seeks out a way to resist. It is resistance to a person who is trying to correct one desire at a time, degree by degree, until all the desires are Yashar El, straight to the Creator, aiming to bestow upon the Creator. The desire called Balak cannot do anything by itself. A desire is just that—a desire—devoid of any strength. The power is found in the intention that directs the desire and works with it. The desire is called Balak, and the intention is called Balaam. The intention of working in bestowal in order to receive is called a “curse.” In this manner, the evil inclination operates in its fullest form. This is why Balak invites Balaam and tells him, “Come, let’s work together.” In the meantime a conflict breaks out between the substance (mare) and the angel (human) who is walking straight to the Creator and aiming himself toward success. On the one hand, within man is the next degree, Moab, the will to receive in Moab, which is Balak. On the other hand, a person intends to control the desire in order to receive, which is Balaam, who is awarded the real egoistic benefit from it. The inner substance in that degree, the mare, cannot advance because it detects the resistance, the angel standing before it, not letting the substance advance, which is help from above. However, the man cannot detect it because he is on the degree of Balak and Balaam. In other words, we cannot advance in the intention, but the evil inclination can no longer fail us with the intention because the previous degree, the Amorite, has been corrected and there is no reason why we should fall now. A person is in a position in which he does not make mistakes in the intentions or desires. The people of Israel stood before the next degree but could not advance further. On the one hand they were blocked by Balaam and Balak, and on the other hand there was no other way to advance. After his blessing, Balaam did not let Israel advance because the blessing had nothing on which to rely. The blessing must “ride” over the will to receive of the next degree in order for advancement to occur. “I have created the evil inclination, I have created for it the Torah as a spice,” because “the light in it reforms him.” This is how we advance with a bigger desire, a desire that is corrected in order to bestow, and we continue degree by degree. This is why there is nothing we can do in the next degree. We advance by failing, but that failing is not because of our corrupted intention. Rather, it is because of the heightened will to receive on the left line. This is why Balaam advises Balak to make the people fail by increasing the evil inclination, the “women” in them. The deficiencies begin with hardening the hearts of the children of Israel with a desire that is more egoistic, more toward oneself. This desire is called a “fornicating woman.” A woman has two “directions”: either a righteous or a whore, meaning in order to bestow or in order to receive. This is why it is possible to make a person trip and fall because in truth, it is impossible to advance without falling. The Torah tells us about the degrees we must all experience. All the actions and names in the Torah are holy. When we kiss a word in a book of Torah during a service, we pay no attention to the word we are kissing. It might very well be Balak or Balaam, yet we kiss and make the blessing of the Torah. The stages of the progress all aim toward our correction. However, there are steps along the way called Balaam, Balak, countries, Midianites, their wives, and we reach a state where we correct them. Once on the degree, the left-right-middle “ritual” repeats itself, meaning a curse from which one is corrected and ascends. Correction is impossible without curses, without the evil inclination. Without Hell it is impossible to rise to the degree of Heaven. Pinhas, Son of Elazar the Priest—the Power or the Light? Similarly, we cannot sense the electricity that runs through a lamp, but we sense its manifestation. In other words, we can only sense manifestations, not the forces themselves. The forces must “express themselves” through a substance. In our case, Pinhas, son of Elazar, was from the priests, from whom we have all the corrections. Can a person curse another person, cast an evil eye on another? If we are talking about our world, regardless of this Torah portion, then of course. All our desires have an impact, even the smallest ones. People are connected; our thoughts are connected. We are living in a global and integrally connected network. We can prove for a fact that there are instances when people think of something on one end of the world, and people on the other end of it think of the same thing at the same time. It was said that this concept was also proven in monkeys. The book, The Hundredth Monkey, reports a study of macaque monkeys on an island near Japan in 1952. The scientists observed that some of the monkeys learned to wash sweet potatoes, a behavior that spread through the pack. Once it spread among a critical number of monkeys—the so-called hundredth monkey—this behavior instantly spread to monkeys on nearby islands. A person knows only about one’s own degree, which is the degree of Balak. Here Balak rules over the piece called Moab. The will to receive in order to receive that operates in a person from one degree to the next, with the aim to receive, is called Moab. Does a person know of the limitation, that there is another, higher place? Yes, this is why we need to draw a bigger force and not let the correction happen. Will we be able to see Moab as we advance in our studies and scrutinize within? 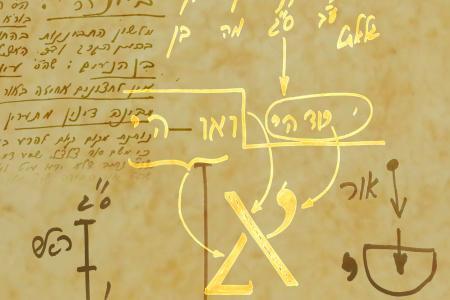 Even without reading the weekly Torah portion we would discover the Torah within us. This is also how Kabbalists discovered and wrote—by sensing it within. The Torah comes out of the will to receive that is gradually corrected. When a person discovers the portion Balak within, does one also discover a speaking mare? He or she will speak just as it is written in the Torah, and at the same time know the details in their true sense. What does it mean that a mare speaks in a person? It is the will to receive. The mare is the female of the donkey. That is, out of Malchut’s ten Sefirot, nine are the donkey and the tenth is the mare. Is it specifically the will to receive that senses the angel? Is the will to receive unable to see? Is it blind? It is specifically the will to receive that will perform the act, that will sense—either in order to receive or in order to bestow. It is there that all the operations of the forces take place. This is why all the forces of correction or corruption aim toward it. Is this why it is said that the Messiah will come riding a white donkey? A white donkey means that a person needs to make the donkey white. Only then will one feel it. What does the whitening mean? There is a strange process happening here. Balaam is the will to receive in order to receive, or even the will to bestow in order to receive. Balaam undergoes a process: in the beginning he wants to curse, but then he swears that he will act only by the command of the Creator, and finally he blesses. Balaam acts with the intention to bestow. No, he cannot do it on the next degree. In fact, Balaam performs no actions here, neither does Balak, nor does the Creator. Only Israel acts. That is, if we want to rise to the next degree, the blessing is before us and we can advance, except we do not have the strength. We need to discover that we cannot advance using Balaam, Balak, the Creator, the mare, or any other factor, until we stand bewildered, not knowing how to advance to the next degree, how to acquire this desire called Moab. The children of Israel must conquer Moab, something needs to appear, and it appears only by connecting to the women of Moab. There is a sexual element here. On the one hand, the sexual desire is very natural, but on the other hand it seems to be a bad example because they took Midianite women. We are not dealing with morals here, or with ethics. In our world, sexuality is animalistic, meaning it exists in animals. But in this portion the sexuality is presented as an obstruction, with the president bringing a Midianite woman into the tent. True, it appears as negative. However, all the measures discussed here are necessary steps along the way. We cannot succeed without them. It is written, “There is not a righteous man on earth who does good and does not sin.” That is, we must go through the sin; we have no choice, even if we do not want it. The order of degrees is such that a person falls and then rises. But the fall is not of one’s own volition, though it is how one builds the ascent. Therefore, Israel did not seek to mingle with the Midianites; they simply had no choice because a person must mingle with all the females of the next degree. To mingle means to be at the degree of the female, Malchut of the next degree, the fornicating woman, entirely immersed in her intention to receive, and afterwards correct it. When rising from one degree to the next, a person needs to seemingly despair, and then ask for help. Clearly, there is a force that opens it before us and helps, but we forget it from one degree to the next. Why do we forget it? Why does it seem to become more difficult? After all, if we got the idea once, it should have been easier. The thing is that we got it, but in the previous sin that we corrected. In the current sin we perceive nothing. Everything we had is in the past, and it is as though we have forgotten everything because we are rising from below upward. It is not that we really forget, but the old ways simply do not work on the new degree. In the correction of “killing the Midianite,” the president of the tribe of Shimon is killed, as well. Why is this so? After all he was part of Israel and was supposed to be corrected? He belongs to the previous degree. So he could not cope with the new degree? He could not cope with it because he connected to her, and they are both in the intention to receive. Both need to correct. It is not only the evil inclination that is corrected; it is also the force that comes down to the evil inclination and connects with it. They both rise together. A person who descends, descends entirely into the intention to receive, down to the Klipa (shell/peel) with all the previous success. Afterwards the light takes effect and saves them both, which is considered that along the way it kills them because they are aiming to receive.